Veggies, beans and corn, tossed together with a cheesy, tangy dressing, give you a salad with an unmistakable Mexican feel! Get a taste of Mexican cuisine, with succulent salads like the Kidney Bean Salad, Mexican Salad Bowl , and Burnt Sweet Corn Salad . A yummy Kidney Bean Salad with an interesting assortment of ingredients, which offer a mix-and-match of multiple textures and flavours. The succulence of cooked kidney beans, the juiciness of tomatoes, the crunch of onions and spring onions, all come together to delight your palate. A pungent, lemony dressing adds to the flavour of this lovely Mexican Kidney Bean Salad, making it a truly memorable treat. The beans and corn are enriched with a smooth dressing of avocado with tomatoes. Mexican salad is very tasty, refreshing and easy to make salad recipe with vibrant colors. The delectable combination of vegetables like celery with tomato paste and herbs, Mexican salad is superb in taste and looks. Mexican carrot salad presents a delectable salad recipe with chopped carrots and ice berg lettuce. A crispy crunchy salad recipe which is sure to fill you up with nutrients and leave a smile on your face. 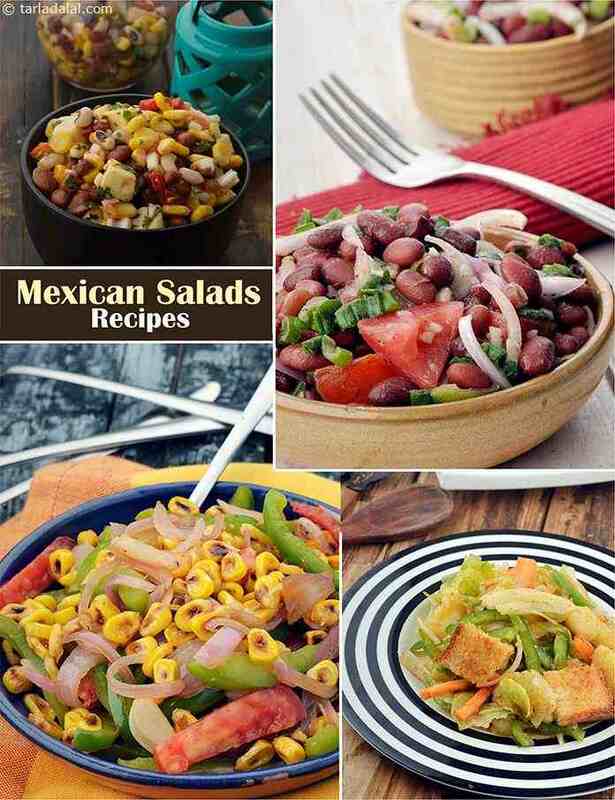 Mexican salad is a tossed over salad recipe which is low in fat and calories and high in authentic Mexican flavours. Pair the mixed vegetables with salsa sauce, herbs and select seasonings and you have a delicious platter of Mexican salad. Enjoy as a meal with with hot soup and breads of choice.